What has Amazon done to improve on previous generations of the Kindle? Head of testing Paul Smith finds out. Have we reached peak Kindle? I think the latest version of Amazon’s eReader could be the last you need. The Paperwhite 4 (officially the 10th generation Kindle) has a 6-inch E Ink (electronic ink) touchscreen. E Ink technology was a revelation when it appeared on eReaders like the Kindle in the mid-2000s, bringing the comfortable reading experience of paper and ink to a digital device. Since then it’s only got better. At 300ppi (pixels per inch), the Paperwhite 4 has almost twice the pixel count of the previous Paperwhite we tested and recommended in 2014. Unlike LED screens on phones and tablets, the Kindle’s high-contrast E Ink display is immune to glare – I’ve had no problems with reflections from artificial lights or reading in bright sunshine. The screen is lit from the front by five LEDs. Disappointingly, the lighting didn’t automatically adapt to the environment, but I could adjust it manually or turn it off completely. The big advantage is that you can read this Kindle in a dark bedroom or tent, or on a flight at night (all places I’ve used it). Unlike a phone or tablet, an E Ink screen won’t mess up your sleep rhythms, so reading yourself to sleep is fine and, unlike a book, you don’t lose your page if you nod off. The entire front panel of the Paperwhite 4 is glass, with no lip between screen and bezel to trap grime. The device is thin, light and very comfortable to hold one-handed – I found handling the Kindle more pleasant than wrestling a thick paperback. I added a case to customise the look, making it more tactile to hold and adding protection to the screen. The cover also auto-sleeps and wakes the Kindle. While the Paperwhite is too big to put into a normal-sized pocket, it’s smaller than a paperback and very convenient to slip into a bag. Books can be downloaded using a WiFi connection. Kindle books are cheaper than printed ones, since you don’t pay for paper, printing or shipping. You can also access thousands of free books from Amazon and elsewhere. It’s easier to get content through Amazon and it has huge paid and free selections, but you can transfer non-Amazon files to the Kindle by app, email or plugging into a computer. There’s just one physical button on the Paperwhite 4, for turning it on and off. Everything else is accessed through its touchscreen. 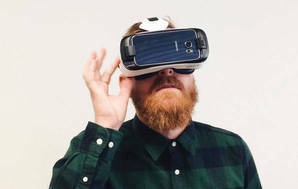 The interface is intuitive – if you can use a smartphone, you’ll have no trouble. Swipe through your library (or search) to find a book and tap the cover icon to read it from where you left off. Then, tapping the left and right of the screen moves back and forward through pages, while a tap at the top displays a navigation menu. Long-tapping a word brings up a dictionary definition. You can pinch to make text larger or smaller and you can change the font, so you’re never straining to read. The Kindle isn’t just good for novels, the only limitation is the lack of colour in the E Ink screen. Black and white illustrations render clearly and crisply. I use it to read Manga (Japanese graphic novels) using comiXology (an Amazon company). The Paperwhite 4 comes with either 8GB or 32GB of storage. The 8GB version can hold thousands of plain-text books. I chose 32GB to store audiobooks from Audible (another Amazon company), which take up much more space. For example, the audiobook of The Handmaid’s Tale uses 150MB, compared with 3MB for the text version. If you do max-out capacity, titles bought from Amazon are stored in your cloud account to download when you want them. Headphones and speakers connect by Bluetooth. A nifty trick is linking the audiobook with the text, so you can switch between reading and listening as your mood or situation changes. The E Ink screen sips power, resulting in weeks of battery life (Amazon says the Paperwhite 4 lasts six weeks if you read for half an hour each day). Playing audiobooks over a Bluetooth connection drains the battery much quicker, but the device recharges fully in three hours. The final trick is this Kindle’s IPX8 rating, which means it can be immersed in 2m of water for up to 60 minutes. Realistically, the rating is overkill unless you plan on using it underwater, but it means you can confidently read in the rain, lounging by the pool or relaxing in a bath. I can’t see what Amazon could reasonably do to improve the Paperwhite 4 any further. As a device focused on one task – reading books – it’s about as good as it can be. 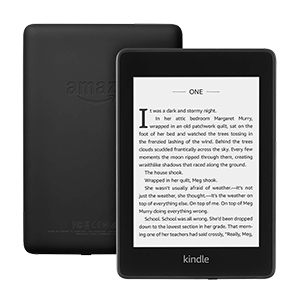 In April, Amazon released the latest version of the entry-level Kindle, which (for the first time) has front-lighting like the Paperwhite 4. However, it’s not waterproof, has a lower resolution screen (167 ppi) and only 4GB of storage. You’d save a few dollars, but I think the Paperwhite 4’s extra features are well worth the extra outlay (which might not be as much as you expect – I paid $230 for mine, $60 less than the RRP).